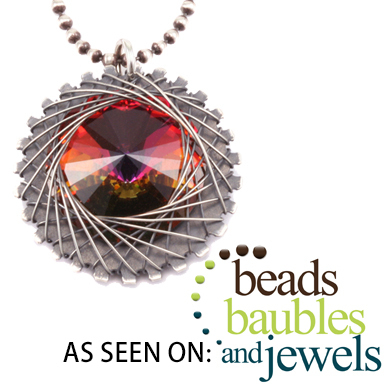 Instructor Colin Mahler shows you how to build a wire bezel using half round and square wire. Frame a cabochon, bead, or coin using this impressive technique. 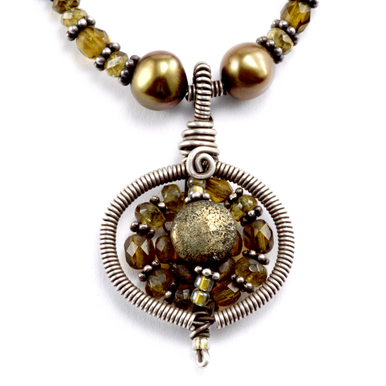 This class is perfect for jewelry makers looking to expand their skills. This class has a run time of 69 minutes. Cutters - Colin uses the Tronex 7223 in this class. German Flat Nose Plier With Ergonomic Handle - $26.95 - These German pliers are the perfect shape and size for this project. Lindstrom flat nose have a slightly different shape on the outside of the jaw and do not work well for this particular project. 22g Copper Square Wire, 10ft - $2.39 - you'll need 3 feet. 20g Copper, Half Round, Half Hard, 5 ft - $0.97 - you'll need 1 foot. I absolutely love this class. Instructions are easy to understand and follow. Thanks for this class and for carrying the wire. 2 Thumbs way up! This is the best wire bezel tutorial I have viewed. Very clear instructions and the teacher's voice is so easy to listen to throughout the whole tutorial! Amazing what you can create with wire! Wonderful visuals, step by step examples of what to do AND not to do and how to fix them. I enjoyed the teacher's examples and the methodical step by step demonstrations. Great bezels and designs result in beautiful pendants. Only limits are your imagination! Excellent class...can't wait to try these techniques! Greetings from Australia. Absolutely perfect tutorial, with all details exactly explained. Your free classes are very much appreciated. I loved this class I learned so much and will most likely watch it again, as I begin to wrap some pendants. Colin did an awesome tutorial! As always Colin rocks! Not only is her crafting skill superb but her ability to teach in the gentle relaxed tone, allows the student the confidence to do the job. I had been struggling for a week trying to make a wire bezel for a bracelet and could not make it work. This tutorial came at just the point when I was ready to re-design the project and forget about what had been the center piece of the design. I know I can do it now and it will be more beautiful than my original idea. Thank you so much! Yet again another very informative lesson from Colin. I have never known anyone teach and demonstrate in such a calm and precise manner as you Colin. Wonderful class. Instructions are great!!! Thanks so much for the video. Learned a lot.....she is a great instructor. I just finished watching this video and it totally helps with my understanding of wrapping! I won't say more as all the other reviewers have stated my sentiments! Amazing job Colin and Beaducation. Another beautifully done video. Thank you for making it available! First wire project and because of this video it turned out lovely. Colin is a very good teacher. I loved the "ta da" after a successful step in the process. Thank you to Beaducation for showcasing Colin in your online classes. Haven't been able to work with wire for the last 7 months due to hand surgery and I found this a fantastic review. Great inspiration to get back into the wire work. Great videography and easy to understand demonstrations, wish I had this when I started a few years ago, life would have been much easier. Thank you so very much. Great class! Colin is absolutely the best teacher on wrapping that I've watched. I am going to get my wire wrapping equipment out and start again. This is inspiring. Thank you vey much. First rate class! No idle chit-chat. Just needed information and yet a comfortable sound. I especially liked the instructor's information on correcting errors (not a usual for tutorials), the different tools that can be used for the same effects, and the different ways to finish off a piece (also not a usual.) Thank you, Ms. Mahler, for getting me over the fear of doing what you've now taught me so well to do. Grazie a lei e a tutti i suoi collaboratori! Corsi e spiegazioni meravigliose fornite con grazia, chiarezza ed una capacità tecnico-artistica fuori dal comune. Mi permetto un abbraccio ed ancora un grande "GRAZIE" da un amico e ammiratore italiano. I am so impressed with Ms. Mahler's teaching style. She is very intuitive about how to present information in that she does not waste words. Yet what she does say is so full of vital information that nothing is left to chance. She simply tells you everything you need to know. Easily the best teaching video I've ever watched and I've watched a lot of them. Brava! I enjoyed this tutorial very much. It was easy to follow and understand. The technique is lovely. I will be wrapping many stones this way. Wonderful class. I throughly enjoyed the class. Very good instructions with close ups . Easy to understand and following! Thank you so much . This is just the class I've been looking for! I have viewed other Beaducation video classes & they are extremely helpful & wonderfully produced. I especially like how they are divided into sections. Colin, you are amazing! I can't wait to make my first pendant while watching your class. THANK YOU!! Ii really watched this video out of curiosity. I've used a minimum of wire work in my jewelry. I found myself enthralled watching Colin work and listening to her instructions. What a fantastic teacher and artist. I may even try to do this technique. I have watched this video several times before attempting the project. I agree with everyone. Colin's technique and the way she task analyzes everything so concisely is amazing. Very much appreciated. I set a bezel today and did all the binding and the bail. I am very pleased with my first attempt. Thank you so much for providing this information and sharing your talents and knowledge. This was an excellent class! I would like to make one suggestion. Instead of plain tape which caused the wire to be sticky. I will use painters tape or construction tape. Thank you Colin for a professional class. Even though my stone was round it still came out beautiful. I am very happy!